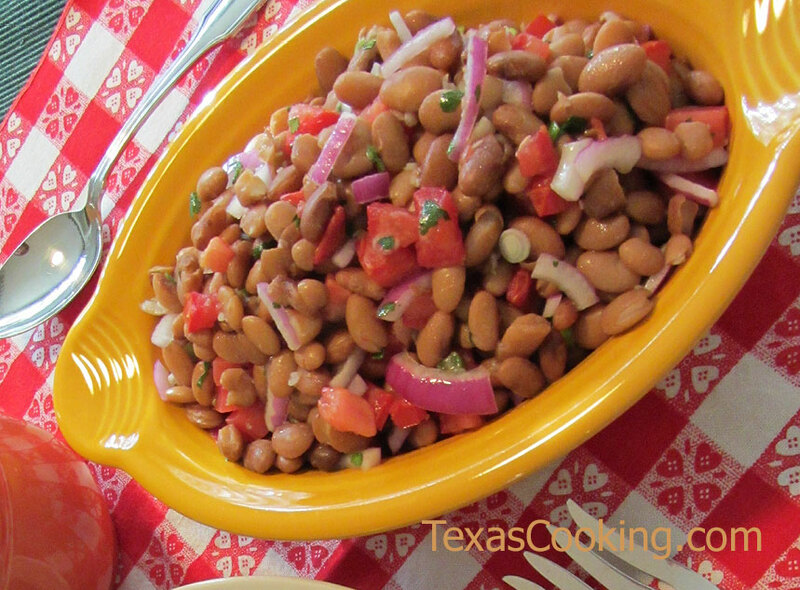 Pinto Bean Salad can serve as a side dish or a light meal. Make this delicious, refreshing and healthful salad with a staple of Texas and southwestern cooking -- pinto beans -- and you'll be more than pleased. The combination of flavors and textures is amazing. Put the pintos in a large Dutch oven and cover with fresh water. Add the bay leaf. Bring to a boil. Then cover and simmer the beans for 30 minutes. Stir in the salt and simmer another 30 minutes until beans are tender. Fish out the bay leaf and discard. Drain the beans and allow to cool until warm, but no longer hot. Combine the lemon and lime juice and salt. Beat in the olive oil gradually until well mixed. Add the garlic and cilantro. Check seasonings and add more salt and pepper, if desired. Pour dressing over the warm beans and mix until well coated. Add the chopped tomatoes and onions and toss well. Note: If you forget to put your pintos in to soak the night before, there is a shortcut: Put the beans in a large pan with plenty of water, bring them to a boil and boil for 2 minutes; then turn off the heat, cover, and let them soak for 1 hour. Then drain and cook as above. People in areas with hard water can cook their beans till the cows come home, and the beans will still be tough or not thoroughly done. If you have that problem, add a scant 1/4 teaspoon of baking soda to the cooking water, and you will have one less problem. See also John Raven's article on how to cook beans.